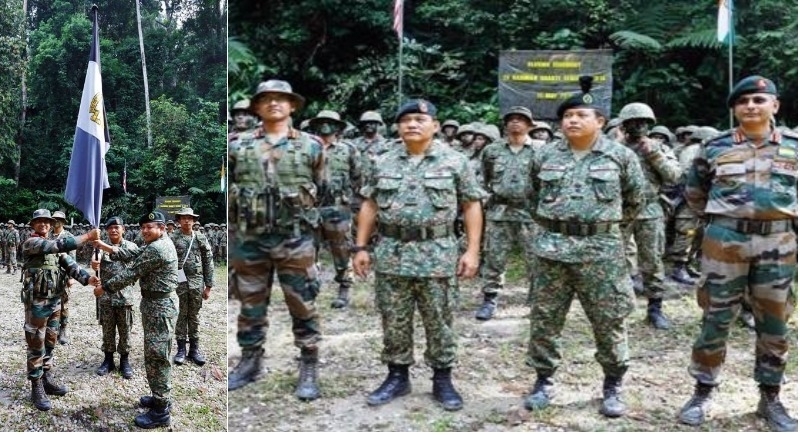 Kuala Lumpur, May 12: The two-week-long joint exercise Harimau Shakti 2018 between Indian Army and Malaysian Army was concluded on Friday with a closing ceremony at the tropical rainforests of Hulu Langat, Kuala Lumpur. The grand finale of the Exercise was a tactical operation on the conduct of attack on the enemy camp. Notably, a joint exercise between the two armies was held in a bid to enable mutual capacity enhancement and assist in building strong bonds of friendship and cooperation. The conclusion ceremony began with a customary salute to Brigadier General Abdul Malik Bin Jiran, Commander 12 Infantry Brigade, followed by national anthem of both the nations. Exercise armbands were taken off from the exercise appointments and the Regimental flag of GRENADIERS was handed back to Col SN Karthikeyan, CO 4 GRENADIERS by Lt Col Irwan Bin Ibrahim, CO 1 Royal Ranger Regiment symbolizing the handing over of the troops back to the Indian Contingent Commander at the end of the Exercise. In his closing address, the Commander complimented the troops from both the contingents for their exemplary conduct, high morale and tactical acumen throughout the Exercise. He also remarked that the Contingents would have learned by sharing their knowledge and experiences. He also complimented the Indian contingent for assimilating and understanding the nuances of jungle operations as per Malaysian doctrine and fighting shoulder to shoulder with their Malaysian Counterparts. The ceremony came to a close with the war cries of both the contingent and customary recital of prayers by the Malaysian Army. Mridul Kumar, the Indian High Commissioner to Malaysia, also visited the Exercise contingents at the Exercise area and complimented the troops on successful completion of the joint training exercise. He was highly appreciative of the high spirits and exemplary drills have shown by the Contingents under challenging conditions and inclement weather. The professional acumen, operational abilities, battle drills and physical endurance displayed by the contingents over the last fortnight, were of extremely high standard and an apt reflection of the level of interoperability achieved during the Exercise. The contingents from Indian and Malaysian Armies have been able to share their experiences in counterinsurgency operations and learn from each other. The future editions of Exercise Harimau Shakti will surely take this legacy forward and will ensure that the two nations continue to maintain close defence ties in ensuring peace and security in the region.